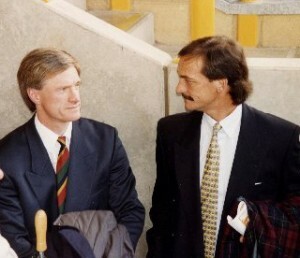 Mel Eves with his former Wolves colleague Kenny Hibbitt. Former Wolves players go up against several ex-Albion men at Telford on Sunday in a game in aid of The Prince’s Trust. League Cup winner Mel Eves leads his Wolves All Stars side into action in opposition to a West Midlands Legends X1 at AFC Telford United’s New Buck’s Head home. The Wolves squad includes the likes of Darren Simkin, Dean Edwards, Andy Turner and Eves, supplemented by Chasetown manager Charlie Blakemore and others who didn’t make the first-team grade at Molineux such as Richard Forsyth, Martin Prentice, Simon Russon, Mark Kavanagh, Brett Hayward and Simon Dunkley. The side have also acquired two guest players in former Walsall stalwart Chris Marsh and ex-Coventry forward John Williams. The Legends squad contains Bob Taylor, Richard Sneekes, Ian Hamilton, David Busst, Tim Clarke and Paul Hall. The game kicks off at 2.30pm but is preceded by a programme of other events starting at noon and continuing at 12.15 with a match between Wolves under-14s and their Telford counterparts. Other attractions include fun stalls, a raffle and appearances by hip-hop group DNA, the Pedmore Panthers cheerleaders, Telford’s Got Talent winner Daniel Crossley and Telford United’s players, the latter showing off the Setanta Shield. Tickets in the main stand cost £10 for adults, £5 for youngsters and £20 for a family of two adults and two children. Admission on the terraces behind the goals is £6 for adults and £1 for youngsters. Wolves fans can now keep a closer check on the All Stars by logging on to the new www.clubwebsite.co.uk/wolvesallstars website. Posted on: Tuesday, July 14th, 2009.